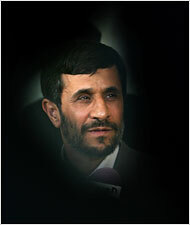 The New York Times has done an interesting job of presenting the softer side of Iranian President President Mahmoud Ahmadinejad. Most recently they ratcheted up the spin machine in their attempts to seed doubt with the American governments contention that Iran is fueling the terrorist lead insurgency in Iraq with weapons and support. Not content with planting the seeds of doubt with words alone, the Times storytellers have dug deep into the bucket of visual manipulation by presenting a flattering portrait like image of Ahmadinejad to accompany their story on the reported summit between Saudi Arabia and Iran. Note the deep thoughtful stare that is accentuated by the wistful shadows and subtle filter blur. The only thing missing is the brandy glass. Violence and chaos are terms that are pretty well defined in society. A person tends to conceptualize events tied to such words by visualizing bombs exploding, bullets flying and all commonly associated images from the ravages of war and crime. A full court press is underway to re-brand self described anarchist Josh Wolf as an embattled journalist who is being wrongly imprisoned for refusing to "divulge his sources". Wolf, whose pen name is "insurgent" on his new blog The Revolution Will Be Televised, has been sitting behind bars on and off for a total of 169 days as of Tuesday February 6th. The New York Times ran a story this morning that details how liberally minded school administrators are seeking ways to circumvent affirmative action bans that have been put on the books by voters in three states. There was a time when conservatives took the mainstream media to task for not covering stories of success in Iraq. I vaguely remember a time past when Laura Ingraham challenged MSM reporters to do the unthinkable such as leave the green zone and talk to Iraqi's so they could put a more honest and balanced perspective on the new. This challenge was met with the kind of puerile outrage and denial that you might expect to get from your child when they are caught doing something both of you know to be unacceptable. Today marks the first day that the 110th Congress will address the hypocrisy of Embryonic Stem Cell Research while calculatedly ignoring other stem cell research that proves to be more promising, faster, easier and more ethical. Saddam Hussein was tried for genocide and crimes against humanity in events that happened over 2 decades ago. His guilt in that one trial spoke to a single chapter whose murderous mark personifies a sliver of the total crimes that Hussein committed in over a quarter century of terror. Yet the mainstream media is beside themselves in trying to recreate the image of Saddam Hussein the killer into Saddam Hussein the victim. The AP is out with a small profile on Saddam Hussein and sure enough they managed to get in a blurb that falls minutely short of painting him as a popular figure in their closing paragraph. Never underestimate the mainstream media for their ability to advance a theme that runs counter-intuitive to the sensibilities of most clear headed individuals. Thus I was not surprised to read that both the New York Times and the BBC furthered the idea that life in Somalia was relatively calm under the Sharia law that was imposed on the Somali people ever since the Islamists ran the warlords out nearly six months ago. Richard Lowry wrote an article that takes conservatives to task for attacking the mainstream media over its coverage of the war in Iraq. The New York Times ran a small blog burst on Hillary Clinton after she made a "surprise visit" to Hunter College yesterday morning. The bloggy kiss up features a soggy picture of a somber looking Mrs. Clinton who appears to be transfixed in deep thought behind a lonely podium. As if the staged picture isn’t stomach churning enough, the staff blogger breathlessly penned the following in describing the rock star's visit. Several of the students clutched copies of the 10th anniversary edition, released last week, of Mrs. Clinton’s book “It Takes a Village.” Mrs. Clinton patiently obliged, signing the books – as well as a baseball, a statistics textbook and even scraps of looseleaf paper. She did not make any public comments about her political aspirations. I seriously didn’t know what to expect when I saw the New York Times profile on a Muslim woman who has joined the United States Army. Despite my expectations, or lack thereof, I had a pretty good feeling that it would be filled with the typical bombastic innuendo and mischaracterizations of the United States military that I have come to expect from a newspaper that that I admittedly loath to read. Thus I was not surprised to see the following at the beginning of the From Head Scarf to Army Cap, Making a New Life article. It helped, Ms. Hamdan thought, that there were so many similarities between Islam and the Army. President Bush and Prime Minister Tony Blair held a joint press conference today to discuss the Baker-Hamilton Iraq Study Group Report. The main goal of the presser was to show unity between the two leaders and discuss the plan going forward. The New York Times took on the cause of an upcoming Supreme Court ruling by framing the new conservative majority as hostile territory for two school systems that are defending their use of skin color as a determining factor in public school admissions. Our friends over that the BBC can’t disguise their bias as they crudely misreport the context of President Bush’s speech at The Riga Conference in Riga, Latvia. It seems that Auntie may think she knows best but in reality her reporting is more of the same from a news media that increasingly views the United States as an adversary rather than an ally. The New York Times is trying once again to convince the public that tipping off alleged terrorist front groups about an upcoming government search somehow falls under the umbrella of “the public’s right to information”. I can see, I CAN SEE!! November 8th, 2006 brings us news of “stunning” breakthroughs involving non-embryonic stem cell research. And to think that it only took the completion of a United States election for the press to cover these stories. Nobody should be surprised when the MSM takes an anti-American angle on just about anything that is printed in the press today. Surprise is mostly reserved for articles that are fair and objective. Yesterday the Washington Post published a below the fold story under the headline “Black Democrats Cross Party Lines To Back Steele For U.S. Senate”. Naturally it didn’t take long for the AP to circle the wagons with their own report headlined “AP Poll: GOP Outreach to Blacks Falters”. In fact it took less than a day.